Discopathy, also called degenerative discopathy, is a process of progressive deterioration of an intervertebral disc, its compaction, shrinkage, and loss of elasticity, and premature and/or accelerated aging of the disc. Discopathy can occur in any of 23 intervertebral discs, including in the lumbar region (lumbar , or degenerative lumbar. If the process affects disc in the thoracic spine, this is chest , and if it’s in the cervical region, it is cervical. A cervical disc located between vertebrae L5 and S1 is typically most exposed to discopathy: the so-called L5-S1 discopathy. L4-L5 discopathy is also common. The most frequent cervical discopathy is C5-C6. Disc pathology has several stages, from the simplest to the most severe form. In some cases, the intervertebral disc may completely dissolve. The critical element of effective treatment of discopathy is directed at pain relief in the joints. Pain is often due to inflammation and comes with an intervertebral hernia and bone protrusion, which put pressure on the nerve endings. Successful treatment of discopathy involves halting the process of degeneration and stimulating regeneration. This method of treatment helps remove inflammation, improve blood flow in the tissues surrounding the vertebrae, and remove contractures in the back area. Unfortunately, traditional treatment methods do not eliminate the causes of the condition, only its symptoms, so they cannot provide the long-term effect, and may even be detrimental to the patient’s health. Therapy using acupressure mats is the only method that simultaneously helps relieve pain caused by discopathy, relaxes muscles, and improves the circulatory system. 1. The mat should be made of natural materials, because with any spine issues, the back experiences increased sensitivity, and contact with unfavorable materials can cause allergic reactions and even slow the course of treatment. 2. The key component of the mat is the filler, which must be sufficiently rigid, yet enough elastic and compliant to repeat the contours of the body of the person who uses it. Coconut fiber is the only material that has all these qualities and is also a natural material. When creating the Pranamat ECO acupressure mat, special consideration was given to the peculiarities of discopathy, and that’s why it is made from 100% natural materials, with a filler of coconut fiber. 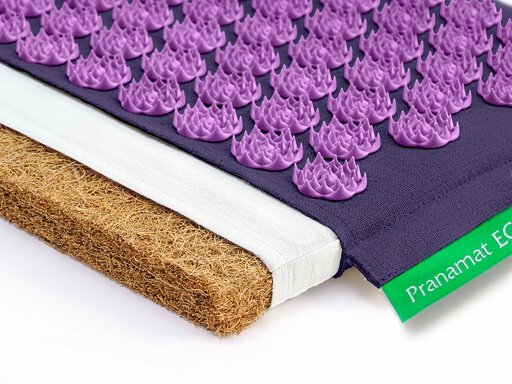 Pranamat ECO acupressure mat promotes rapid relief of pain, accelerates blood circulation, improves general body condition, and overall nervous system functioning. Start being healthy and happy today with Pranamat ECO!